Every once in a while a great book on transformation graces our society. 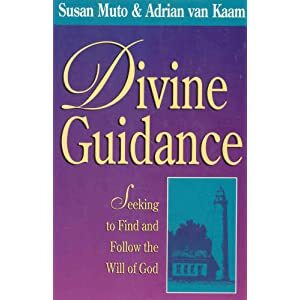 Divine Guidance is just that. Writing for our everyday hearts, Adrian van Kaam and Susan Muto reflect on twelve pieces of transformation-wisdom: Diving Deeper, Standing Still While Still Moving, Repentance, Conversion, Forgiveness, Compassion, Meekness, Peace, Poverty, Purity, Response, and Fulfilling our Life’s Calling. What’s best, this gold mine of wisdom has small chapters, none longer than 18 pages. A great read. There is a lot to worry about in this life. Dateline and 20/20 capitalize on it. We fear about our job security and the next pandemic. I could not sleep last weekend, lain awake after a watching a two hour exclusive on the story of a 19 year old girl who was kidnapped and extinguished. All I could think about was how to protect my daughter. How, in the face of tremendous grief and evil can we transform our worry to wonder? This is the audacity of the spiritual life. It takes seriously the horrors of this life. It stands up to them and extinguishes future evil with diamond hope. It not only cultivates a life of wonder. It teaches the everyday human to step beyond this world, or sometimes below it. And in turn, the healthy spiritual life teaches us to return to this life with love like a transforming fire.